UNITED NATIONS, April 14 (Xinhua) -- A Russian envoy to the United Nations on Saturday accused the United States of violating international law by conducting airstrikes against Syria without the approval of the Security Council. "This is how you want international affairs to be conducted now?" 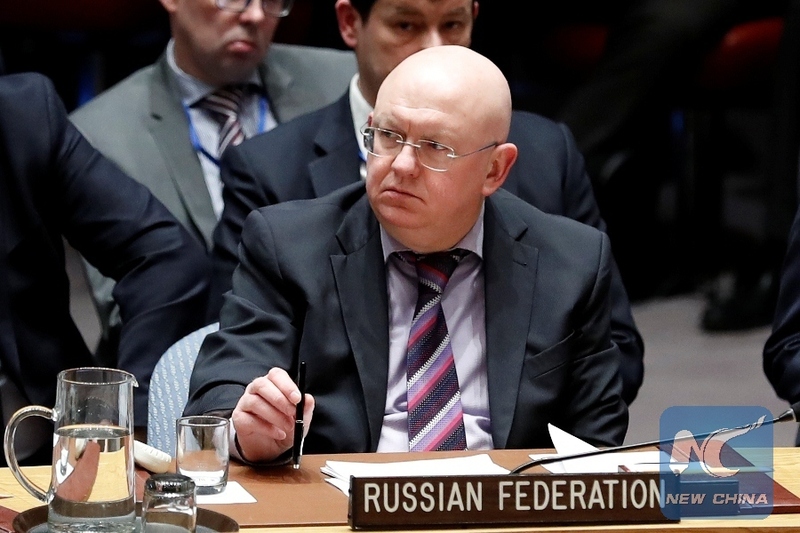 Russian ambassador to the United Nations Vassily Nebenzia said at a Security Council emergency meeting requested by Russia. The Russian envoy described the attacks as an act of "hooliganism in the international arena." The U.S. actions led to deterioration of the humanitarian situation in Syria, he noted. Russia asked the Security Council to condemn the "aggression" against Syria from military strikes conducted by the United States, Britain and France, also permanent members of the Security Council. Russia circulated a draft resolution ahead of the Council meeting to discuss the military operation by the three countries in response to an alleged chemical weapons attack in Syria. The brief draft, which was seen by Xinhua, contains only five paragraphs with three operative ones. It condemns "the aggression against the Syrian Arab Republic by the U.S. and its allies in violation of international law and the UN Charter." It further demands that the United States and its allies immediately end military action against Syria and refrain from any further use of force in the future. The Russian ambassador has insisted the council vote on the Russian text at the end of Saturday's emergency meeting, which his delegation had requested. The United States, France and Britain, all of them permanent members of the Security Council, launched missile attacks in Syria on Friday following reports of chemical weapons use in Douma near the capital city of Damascus on April 7. Nebenzia blamed Friday's joint military strikes, saying they violated international law and undermined the authority of the Security Council. He reiterated that no chemical attack had happened in Douma. U.S. ambassador to the United Nations Nikki Haley said at Saturday's emergency meeting that the three countries "acted to deter the future use of chemical weapons by holding the Syrian regime responsible for its atrocities against humanity." She noted that "a large body of information" indicated that the Syrian government used chemical weapons in Douma on April 7. Haley indicated that the military action came after an impasse at the Security Council. "We did not give diplomacy just one chance. We gave diplomacy chance after chance. Six times: That's how many times Russia vetoed Security Council resolutions to address chemical weapons in Syria," she told the Security Council.